Tsumago Juku (妻籠宿) is the major tourist spot in Kiso and southern Nagano prefecture. It is the Edo Style town with over 65 Edo Style houses on one street. Tsumago Juku was used to be one of post town on Nakasendo Road. Therefore, many travelers between Edo and Osaka visited. Tsumago Juku is the first registered scenery of historic districts because many houses built in Edo Period were remained in great conditions. When you walk on the main street, you will only see the Edo style houses. There is parking and restroom at parking. You can get a map at parking. Tsumago Juku was 42nd post town out of 69 on Nakasendo road. In 1843, Tsumago had 31 Hotels, one Honjin and one secondary Honjin. Secondary Honji, Wakihonjin, Okuya is used as the museum of Nagiso. It was built in 1877 and still preserved in great condition. Kumagaya House was built in early 19th century. 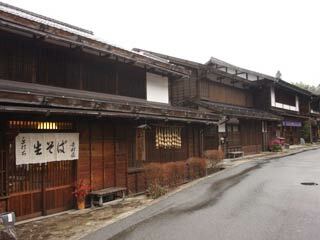 It is popular Nagaya style houses in Edo Period. Most of those remaining houses are still used as gift shops, restaurants, food stands, and hotels. There is no modern style houses on the main street of Tsumago Juku. So, it offers real Edo walking.